I blogged a little while ago about a handsome old clock that I’d bought while attempting to shop for old books. 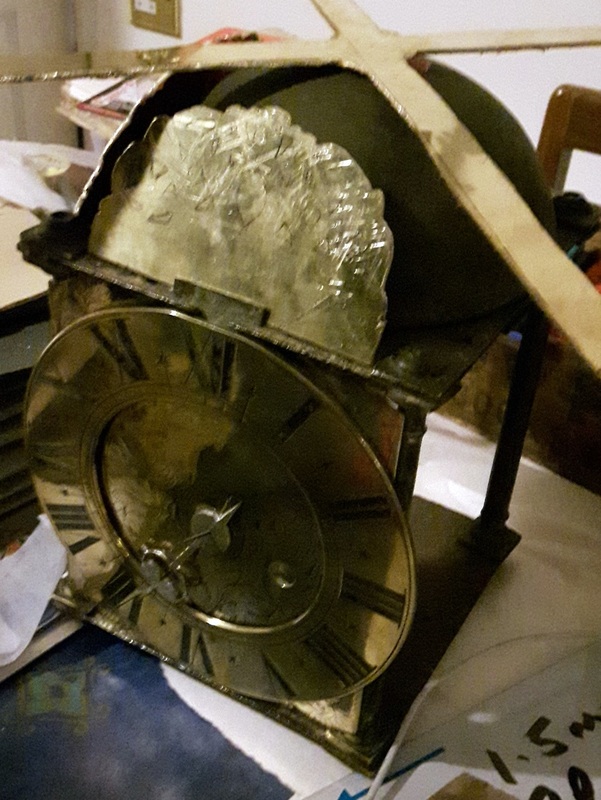 I am no clock restorer – but I hope that the Reader will allow me to blog a little upon my first amateur steps to try and restore this wonderful timepiece. 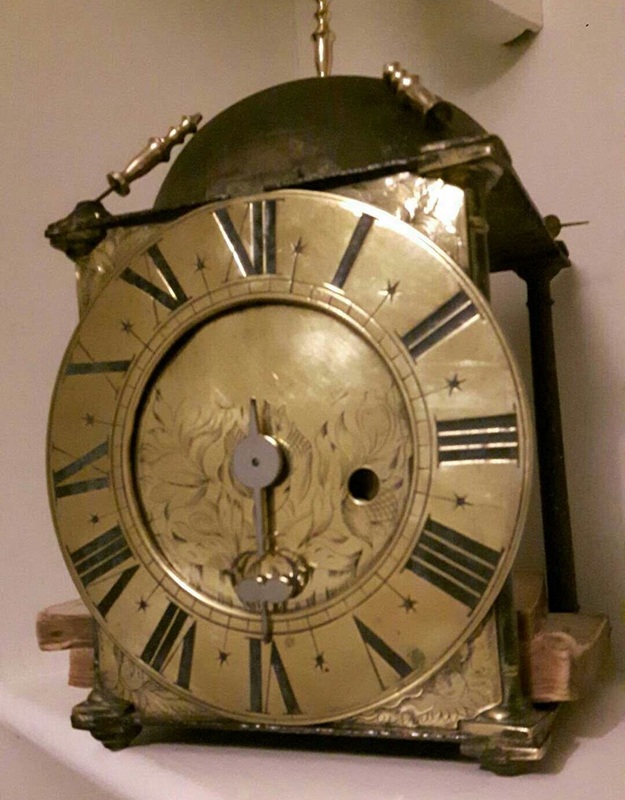 The first job was just to give the frame and dial that I’d bought a bit of a clean, which aside from uncovering a few old screw holes lost in grime, showed how long it had been since the clock had last been looked at properly – the top of it was encrusted with ancient candle wax. Some quick notes on what was needed and where it would end up. Bolts to fit the thing together, as well as other odd finishing pieces. This list does not include the tools I’ve also had to amass to even begin attempting this project. So far I can tick a few things off. I’ve bought a bell – a beautiful thing that is probably about the same age as the clock if not a little earlier. The hammer is going to be tricky though, and I’ll probably end up making that myself to fit the shape of the old holes in the top of the clock. Some things piled on top of the clock. 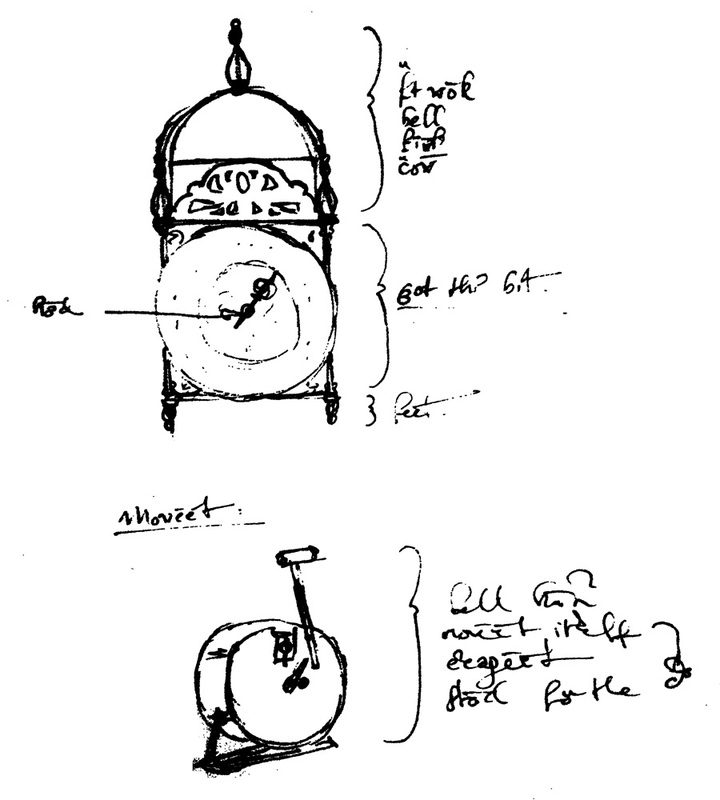 I’ve also got two mechanisms, I spent a long time trying to find one that was front winding and would line up with the old winding hole, but the movement from the ~19th century conversion that created the old winding hole must have been pretty custom, so I’ve decided to go for a rear-winding movement to keep it simple. 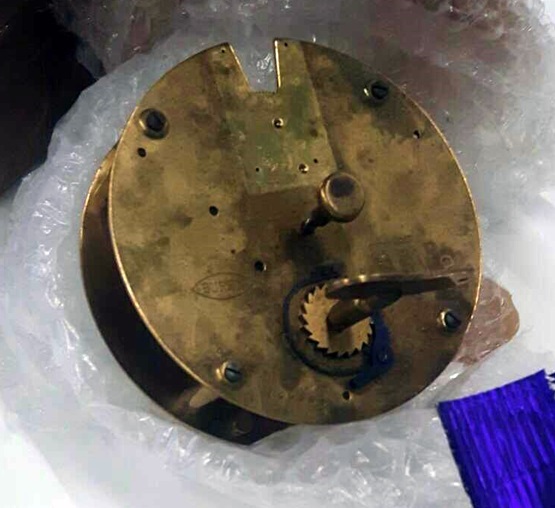 One of my mechanisms is a very incomplete 19th century French carriage clock movement, the other is a simple Swiss movement from the 40s, which should be easy to add a passing strike to. A Swiss movement – I have since bought an escapement for it too. I’ve bought some nice hand-cast finials, which are surprisingly similar to examples used by Savage on his other clocks. 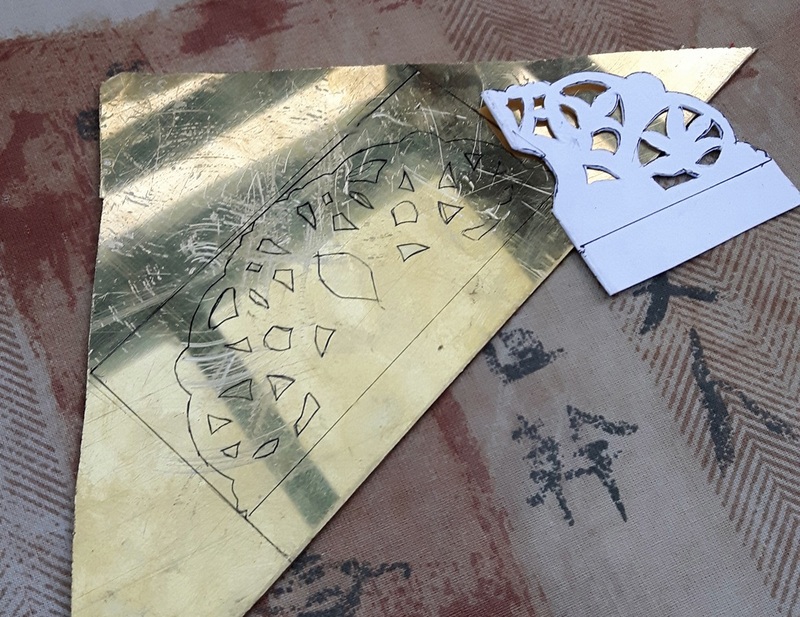 There’s also a bunch of brass sheets, which will I’ll be cutting and engraving to make up the several parts of the clock which were custom to it and can’t be sourced easily – namely the fretwork, doors, movement-stand, and crown. Lastly there’s the hand – just one, since my clock is early enough to be single-handed – I bought a nice laser cut reproduction, which I can work down with a file to make look hand-made and original. Oh, and I haven’t bought any feet or bolts yet. So, what have I done so far? Firstly, I had to make up a template for the fretwork. I’d decided to start off by cutting out all the brass so that I had everything I needed for assembling the clock. 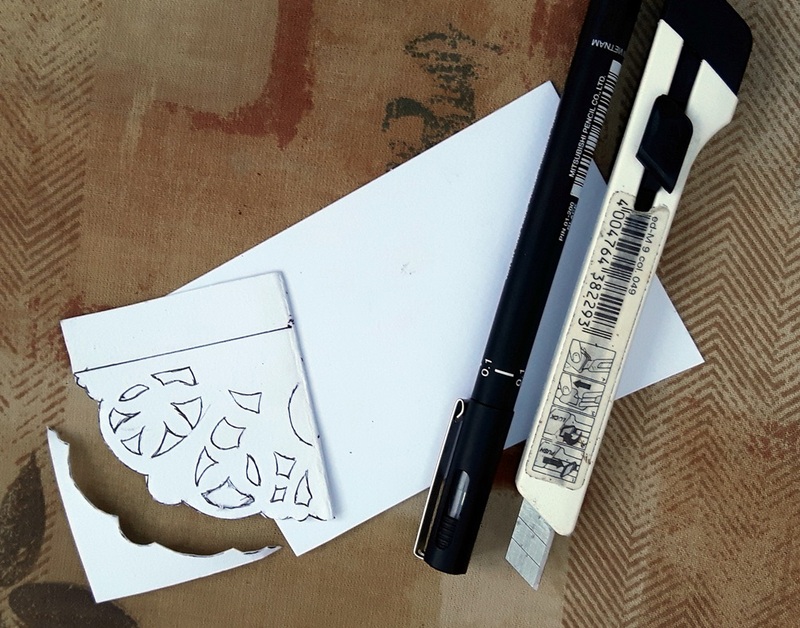 Once a template was drawn out onto card and cut out I could use that to stencil the design onto the brass. 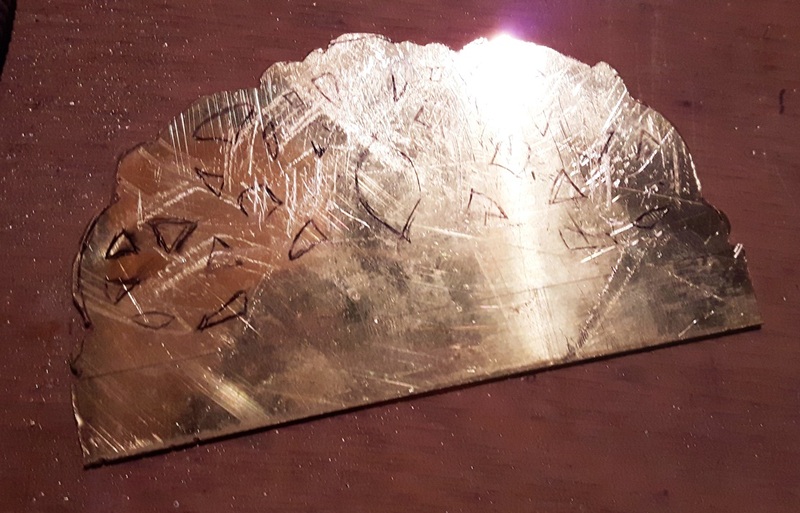 Then it was into the vice for cutting, first with a saw and then the detailing around the edge with a file. Next job will be piercing the fretwork, I haven’t started that yet. 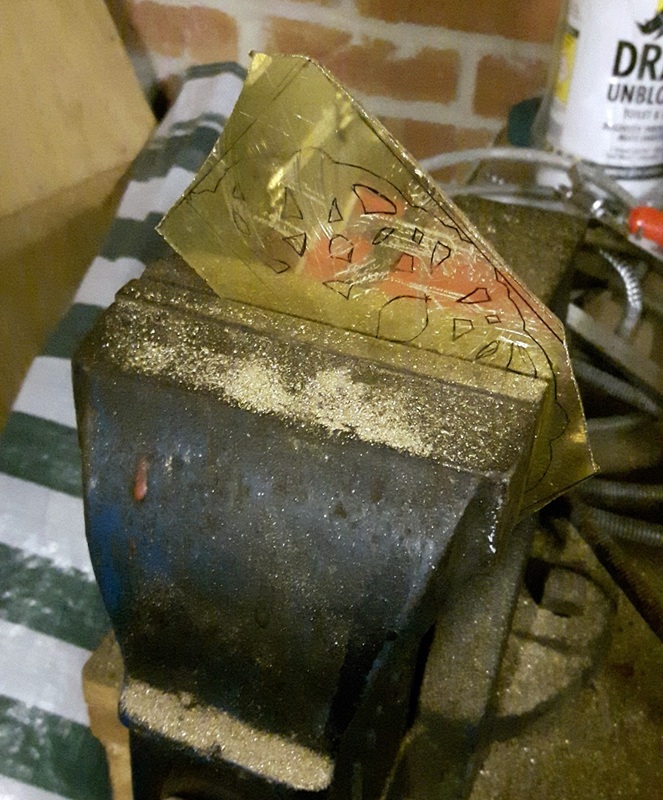 I’ve also cut out the crown, which needs filing down and then bending so that it will fit over the top and support the bell. I’ve also hand-finished the clock hand to make it look more handmade. Some more things on top of the clock. Until next time, happy Reader! Yes, wintery can be spelled that way. The Reader will allow me pause to put my odd attempts at poetic creativity here – not every blog post can be as interesting as others – and, now that I’ve been allowed this dull pause in interesting content, go and find something more interesting to read. And breathed the winter shore. That stand up here no more. And shall not come again. When I’ll go west and still. Four and five and six. The thorn of state and crown. To help it burn more clear. Still turn those senseless clocks. We’ll work for better ends. Mocked the quiet ambitions of man. Are no comfort in this bleak eternity. 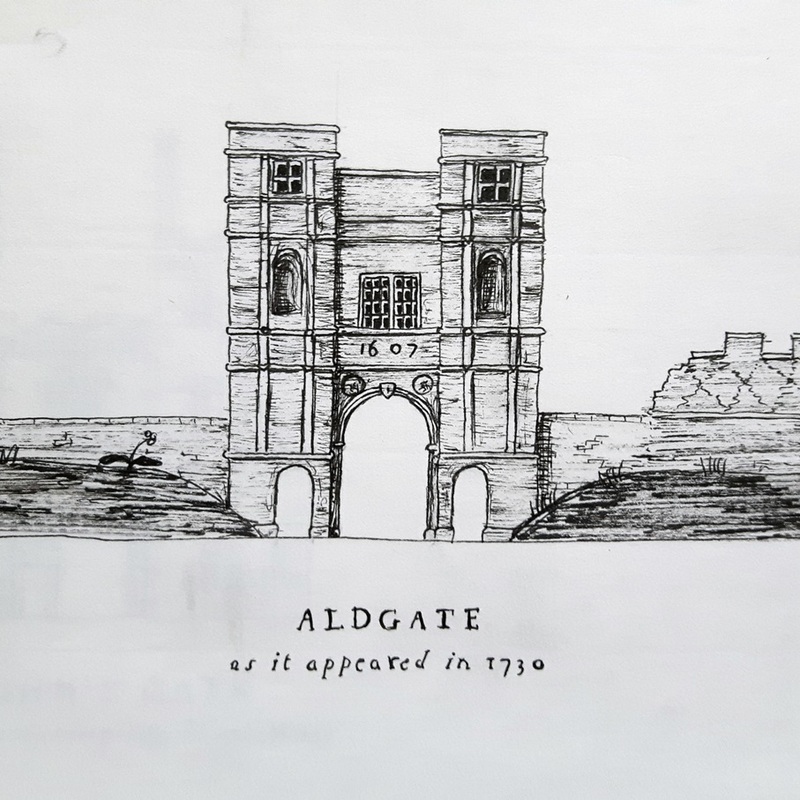 It’s been a while since I had a series of posts going on in this blog – the last was my pre-written history of London’s gates – so I thought I’d try something I’ve wanted to write for a good while; a history of some books. In case the Happy Reader is unaware, I’ve got a lot of them. I’m in the middle of cataloguing them (something I’ve claimed to have been doing for about three years now), but I’d guess I have at least three hundred volumes stretching from the 20th century back to the 15th. Here’s the history of a few (we’ll just have to wait and see exactly how many) of them, with this first post being on a fascinating old book I bought a few years ago. 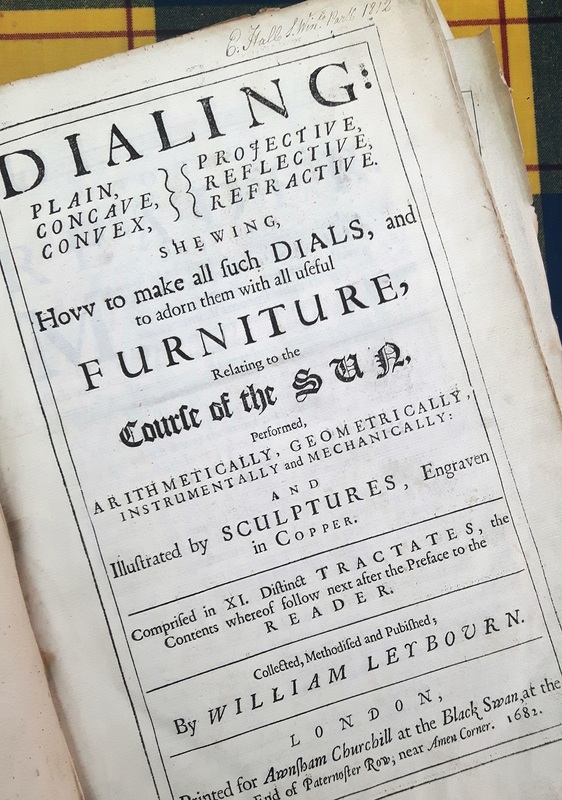 The full title of this first volume is lengthy – Dialing: Plain, Concave, Convex, Projective, Reflective, Refractive, shewing, How to make all such Dials, and adorn them with all useful Furniture, Relating to the Course of the Sun – and the book itself is as grand as the title; folio sized, and full of large engravings of sundials and mathematical scales. It’s a first edition, printed in 1682, and still in the majority of the original binding – it’s on my list of books to get professionally restored and one that I would never attempt to work on myself. It was written by William Leybourn, a seventeenth century surveyor and mathematician, and printed for and sold by an extreme Whig and Williamite who was involved in treasonous activities during Monmouth’s Rebellion – one Awnsham Churchill. My copy is a splendid survival. 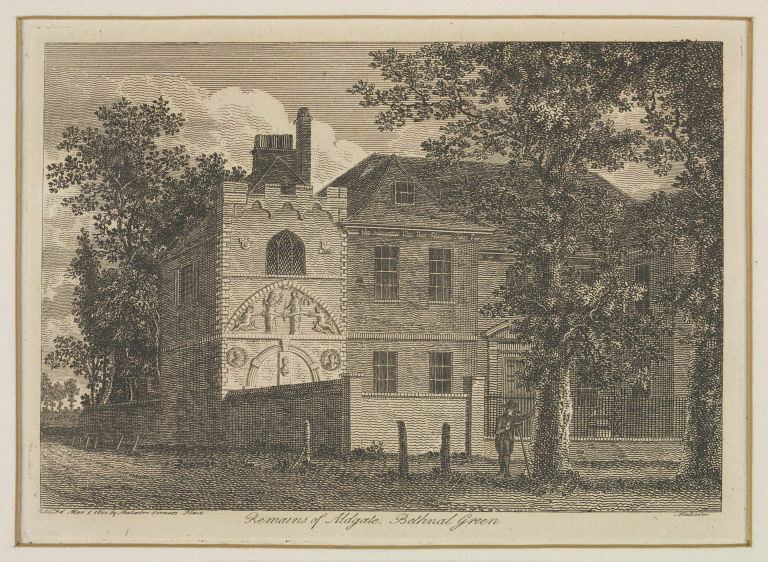 It was originally bought in 1682 by Joseph Moxon, a famous mathematician and surveyor in his own time; he had grown up as a Royalist exile in the Netherlands, and when he bought my book was the advising hydrographer to King Charles II as he rebuilt London’s watercourses destroyed in the great fire. Moxon, by a note in the front cover, seems to have lent the book out and found it necessary to add the inscription Joseph Moxon lend mee. 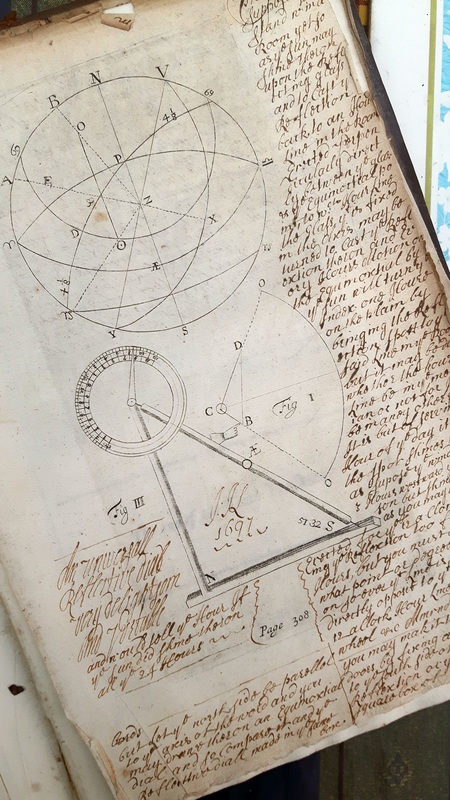 Moxon must have had a particular interest in sundials – in 1697 he published his own work on designing and creating them. This is where the most active owner of this book comes in, Isaac Kirk. Kirk was given the book as a child in 1690. His childish handwriting repeats his name countless times over the front and back endpapers of the book, along with a faded Sunday school rhyme and a few other phrases that sound like the sort of thing a theologically minded parent or schoolmaster might have taught a child – things like put away from you all Evill and I ask not for Evill but Shun yt. 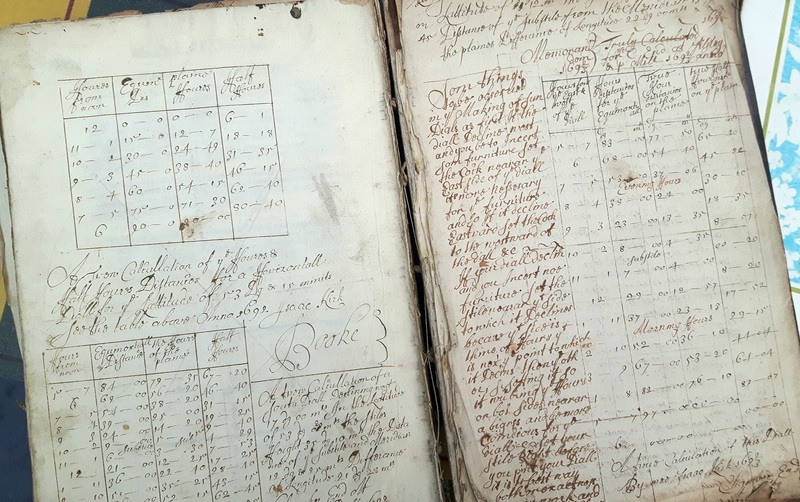 Isaac took a great interest in this wonderful book, and as he grew up he clearly became a skilled surveyor and mathematician – and a keen ‘Dialer’. Unlike almost any other annotator in any of my books he named and dated every note he made, many of which are long calculations and solutions to problems poorly outlined in the text – some of which he claims as his own invention or idea. There are also grand tables for calculating different angles for the dial depending on latitudes. Amazingly, he also hand-rubricated the entire book with his own pen. There are plenty of grand engravings, some have been enlarged upon by Kirk. He lost interest in the volume in about 1705 when his notes trail off (although it is quite amazing that for some 15 years he regularly made new notes in the margins of the book, all on the art of creating sundials), he returned briefly to the pages in 1715, when a few small notes indicate that he had re-checked several sums and found them to be correct. Kirk himself is a very interesting character, and it took me a long time to track him down – it was one small note towards the end of the book that gave him away; a line of latitude that relates to a sundial he built in Pilsley, Derbyshire. I had misread Pilsley as Tilsley, so hadn’t managed to find him before, and only once I traced the route of the line did I recognise the name and connect the man to the places he knew. Isaac lived down the road from Pilsley, and turns up in Derbyshire records as Isaac Kirk of Shirland Lodge, a freemason and surveyor. 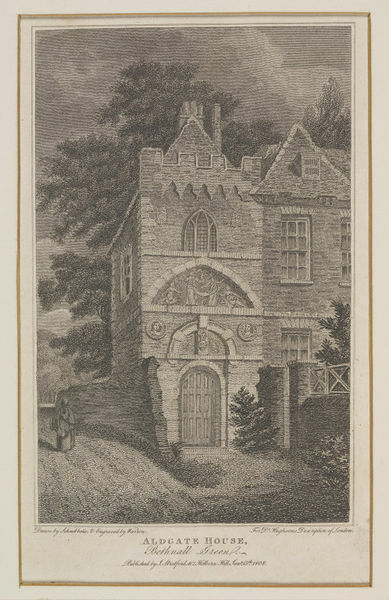 He was important enough to take charge of repairing the bridge at Swarkestone, and may have worked on Pilsley Hall – since he references his work on a sundial at Pilsley in relation to a ‘Great Chamber’; the main room of an old hall house. Kirk last appears in my book in 1715, and last appears in records in 1717; no one put their pen to the pages of my book again for almost a hundred years, when the book turns up only just down the road from where Isaac lived. This owner was Elijah Hall, a well of mill owner who lived at South Wingfield Park, who came to own the book in 1812. Hall himself would become involved in an interesting moment of British history a few years later, when his mill workers refused to work in the face of the industrial revolution and the introduction of machinery. This turned into an armed uprising called the Pentrich Rising, which shortly afterwards was crushed by the government. One of the men who challenged Hall over the new machinery in Hall’s mills would be among the three last people executed by beheading in the British Isles. 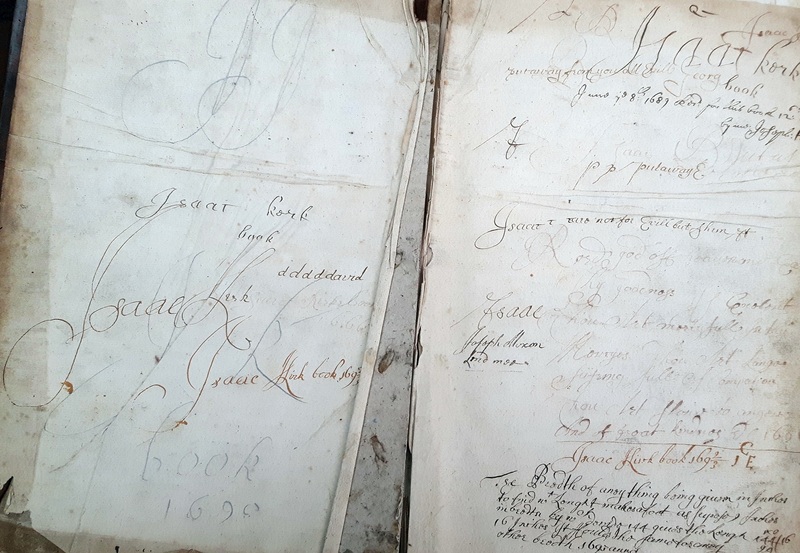 He was the last man to write his name in the book, and no other notes appear recording its history since then. 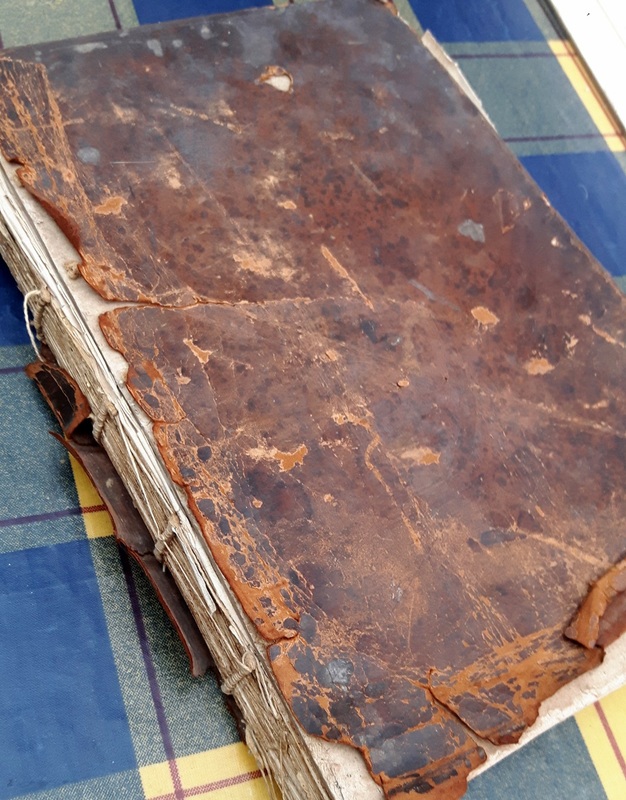 The next step in its history will be a trip to the restorers before it deteriorates any more – the spine is already missing and several pages are loose, with the front board detached and leather pealing away. Fortunately though, once I have the funds together to get it properly restored, the unique history of this book and the wonderful musings of its owners can be preserved for as many centuries to come as the aged pages have struggled through until today.